Lucky for us, Maple Ridge has its own free monthly TED-like experience – Local Voices. This ongoing series celebrates the City of Maple Ridge, past and present, through the voices of our citizens. Presentations combine talks, readings and performances with community dialogue. Join the audience on the first Monday evening of each month for conversation with your neighbours who share who they are, why they live in Maple Ridge and what they do here. Hear about their work, studies, volunteerism, creative passions, and life stories. Every session is a surprise and you leave marveling at the amazing people who live in this community, each with such incredible talents and fascinating life experiences. Presented by the Maple Ridge Community Heritage Commission, the Maple Ridge Historical Society, the Maple Ridge Family History Group, Golden Ears Writers and the Maple Ridge Library. 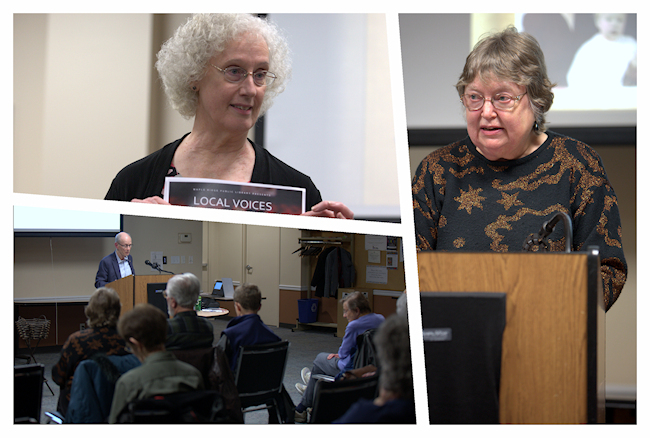 For more information about Local Voices contact the Maple Ridge Library at (604) 467-7417 or check the Events calendar.